As explained here, "The Bishop of Oporto. [Portugal] tells the Observador website that, 'we should never refer to the physical virginity of Mary.' 'The Old Testament says many times that Jesus was to be born of a maiden, a daughter of Israel, who was simple, poor, and humble. But this is truly just a reference to the full devotion of this woman to God. The gift of being mother of God was given to Mary because she had an undivided heart. What matters is full giving of herself...There certainly are women with a ruptured hymen who are more virgin in the sense of full devotion to God than some with an intact hymen.'" Bishop Manuel Linda is, indeed, a heretic. He is part of a movement to attack Our Lady in preparation for the Man of Sin. Since the fall of Adam and Eve in the Garden of Eden, Satan has been able to use the weapon of impurity very effectively In the 16th century he used as his tools the founders of the two Parent-Protestant religions in Germany and England, Martin Luther and King Henry VIII. The first founder entered a sacrilegious marriage, the second an adulterous one. Our Mother Most Chaste being dethroned from their hearts, there was no other logical course for them, than to exile Her from their man-made churches and from the hearts of their millions of followers. But the devil could not hope to corrupt completely Christ's Mystical Body, the Catholic Church, unless he could first succeed in dethroning Mary, the Mother Most Chaste, from the hearts of Catholics. The Lord Jesus is angry with many of His ministers. Our Lady told Fr. Gobbi that, "The hour of divine justice and of great mercy has now arrived. You will know the hour of weakness and of poverty, the hour of suffering and defeat, the purifying hour of the great chastisement. The great trial has arrived for your Church. Those errors which have brought people to the loss of the true faith have continued to spread. Many pastors have been neither attentive nor vigilant and have allowed many rapacious wolves, clothed as lambs, to insinuate themselves into the flock in order to bring disorder and destruction. How great is your responsibility, O pastors of the holy Church of God! You continue along the path of division from the Pope and of the rejection of his Magisterium..." (November 15, 1990). To those consecrated to Her Immaculate Heart, Our Lady has said, "A great wonder is about to be accomplished in your time, even though for the present it is happening in silence and mystery. In the struggle between the Red Dragon and the Woman Clothed with the Sun, in which heaven and earth are taking part, the heavenly powers and those of hell, your Mother and Queen is each day accomplishing an important step in the realization of her victorious plan. Therefore I say to you: soon the desert will blossom, and all creation will become again that marvelous garden, created for man to reflect in a perfect manner the greatest glory of God." (November 28, 1979). "..the woman was given the two wings of the great eagle, so that she could fly to her place in the desert, where, far from the serpent, she was taken care of for a year, two years, and a half year. 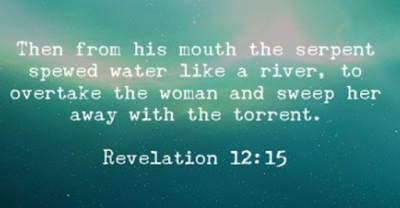 The serpent, however, spewed a torrent of water* out of his mouth after the woman to sweep her away with the current. But the earth helped the woman and opened its mouth and swallowed the flood that the dragon spewed out of its mouth. Then the dragon became angry with the woman and went off to wage war against the rest of her offspring, those who keep God’s commandments and bear witness to Jesus." (Revelation 12: 14-17). 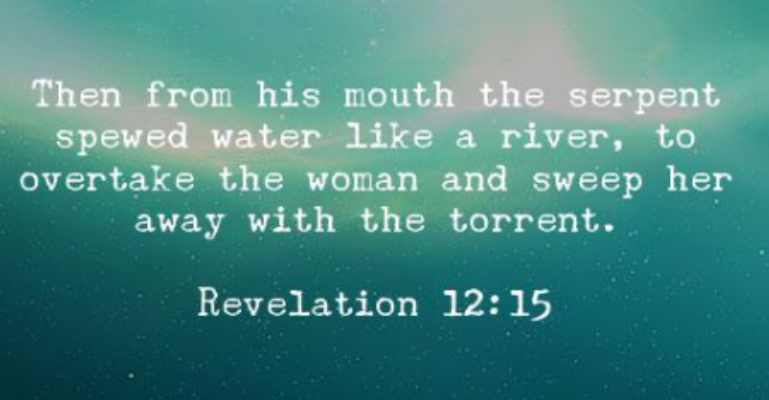 * And what is this "torrent of water" Revelation speaks of? The torrent of water consists of false theological opinions which attack Our Lady and her perpetual virginity. More on substituting the Apostle's Creed for the Nicene Creed every Sunday here. My last post on the subject may be found here. Even the National Catholic Register now admits that many within the Church's hierarchy have lost their moral compass. See here. It was Sister Lucia of Fatima who said: "Let people say the Rosary every day, Our Lady has repeated that in all of Her apparitions, as if to fortify us in these times of diabolical disorientation, in order that we not let ourselves be deceived by false doctrines...Unfortunately, in religious matters, the people for the most part are ignorant and allow themselves to be led wherever they are taken. Hence, the great responsibility of the one who has the duty of leading them...It is a diabolical disorientation that is invading the world, deceiving souls! It is necessary to stand up to the devil." Pray your Rosary every day. Things are going to get much worse. 7 True Christmas miracles that will restore your hope for the holidays..
From Reader's Digest: 7 True Christmas Miracles That Will Restore Your Hope for the Holidays. From American Spectator, the pederast legacy of Wright, Wuerl and Dinardo - see here. For some 28 years, I have been saying that homosexual men do not belong in a seminary and that such persons should not be ordained. In fact, in a piece written for The Wanderer back in the 1990s entitled "A possibility wrought with dire implications," I wrote: "On October 1, 1986, the Congregation for the Doctrine of the Faith published an Instruction entitled 'Letter to the Bishops of the Catholic Church on Pastoral Service for Homosexual Persons, signed by Joseph Cardinal Ratzinger and approved by Pope John Paul II. In this Instruction, Cardinal Ratzinger writes, 'It is necessary to point out that the particular inclination of a homosexual person, though not a sin in itself, nevertheless constitutes a more or less strong tendency to an intrinsically evil behavior from the moral standpoint. For this reason, the very inclination should be considered as objectively disordered.' (No. 3). I was ridiculed for saying this. In fact, I have been referred to as "mentally ill" and as being somehow "unstable" for saying this. Now, under pressure from a laity sick and tired of the rampant homosexual abuse culture, look at what Francis is finally saying here.